SITUATIONAL AWARENESS REMOVES CHALLENGES OF EMERGENCY SITUATIONS. Managing service outages during times of emergency can be daunting. Quickly and safely restoring service following major storms and outages is critical to the recovery of the affected service area. Managing the restoration efforts is daunting, even for well-prepared electric, gas and communications utilities. Challenges include marshaling emergency responders; managing external crews and contractors; and interfacing with desperate customers. These challenges must be addressed in adverse environmental conditions, with the knowledge that each additional minute of outage increased risk to life, limb and property. Ronin empowers utilities to tackle restoration challenges by significantly improving their situational awareness. Ronin provides operations centers real-time visibility of locations and dispositions of work crews, assets, and resources on a service area map. Managers can task and communicate with crews in the field directly through the map interface. They are enabled to efficiently and confidently deploy crews, provide accurate ETRs and help assure crew safety. The Ronin Platform connects all parties through a real-time common operational picture. Work crews, emergency personnel and others in the field simply download the Ronin Platform map-driven mobile app onto their smartphone or tablet. No specialized equipment is required. Ronin connects all parties through a real-time Common Operating Picture, with the ability to share status, pictures, video and on-screen annotations. The Ronin Platform integrates with all existing systems and infrastructure – such as OMS, WMS, cameras, and weather forecast feeds–to support workflows and automate the supply of pertinent information to the people who need it. With the ability to instantly visualize critical information in the context of they are and what they’re doing, managers and crews can make quicker, better-informed decisions and optimize the application of restoration resources. 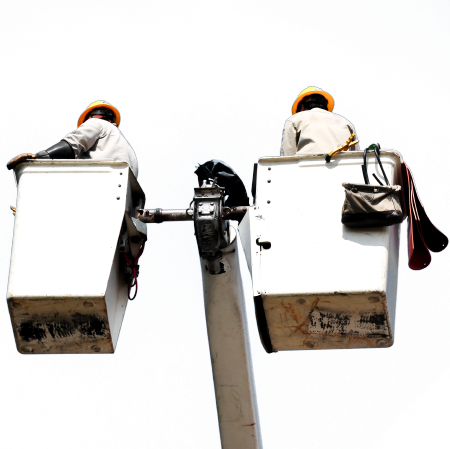 The Ronin Platform improves operational visibility and communications enabling utilities to realize improved operational efficiency, quicker response times, reduced restoration costs and considerably lower time to restoration. Visually track crews’ progress and FTE; status of crews nearby a reported outage. Know when crews will free up and efficiently reassign them. Use geofences to delineate outage areas, areas of responsibility or danger zones. Crews and managers can see them on the map and be alerted when they move in or out of them. Broadcast notifications to all crews in real-time as conditions change. Chat directly with a specific team or teams assigned to specific job about their status. Crews efficiently receive the information relevant to them in a single screen. Inform affected subscribers when a crew arrives at a location, begins work and completes restoration – as it happens. Data on crew locations, communications and jobs are stored for later review and reporting. Useful for contractor invoice verification, investigating possible criminal activity and training and continuous improvement initiatives. Improve safety of work crews with location tracking, a direct communication link and a panic button to request assistance. Use telestrations to share freehand drawings on maps as another way to improve efficiency in communications and visualize information. Mark locations of depots, assets, resources or other points of interest in the field. Associate them with outage restoration tasks and workflow. Tag them with notes and directions for work crews. Especially useful for helping external crews unfamiliar with the service area. Share video feeds, drone images or data from other IoT devices and systems to improve situational awareness and crew preparation. Crews, contractors, and emergency responders can quickly download the Ronin mobile app and immediately join the restoration effort, sharing location, status and critical information. Ronin was developed to maximize the value of existing technology by intelligently integrating data yielded from all sources to minimize the gaps in your operational picture. For more information about the Ronin Platform reach out to our team at info@coolfiresolutions.com.